This issue's column is taken from a chapter in my new book Scuba Fundamental—Start Diving the Right Way, which aims to help people prepare for scuba diving, understand how the process works and make the right choices once they start. Instructor in pool with students. Photo by Barb Roy. The chapter “Choose Wisely” is a guide to making probably the most important decision of all: selecting the right instructor. I thought the topic might be interesting for current divers too and not only so you can advise friends who are thinking of learning to dive. Much of the advice could also be applied to the search for the right person to take you further in the sport, into technical diving, for example, or into the professional ranks. Strange as it may seem, most people do not choose the person who actually teaches them to dive. Instead, they just go into the dive shop or scuba club closest to their home and announce that they have decided they want to learn to dive. Or perhaps, on a whim, they make enquiries at the dive centre in the hotel where they are staying while they are on holiday. The club, shop or centre then assigns them an instructor. This may be what commonly happens, but it is not necessarily the best way to begin. The decision as to which person will teach you to dive is far too important to be left to someone else or consigned to random chance. The dive centre, shop or club you approach and the scuba diver training agency they represent have some impact on the quality of the diving course you get. But by far the most important factor is the person who actually teaches you. The personality, ability, dedication and professionalism of your dive instructor have a direct and crucial bearing on whether your scuba diving course is the first step on the path to a lifetime of adventure or whether you abandon the sport early, having wasted a good deal of time and money. Yes, it is THAT important! The drop-out rate in scuba diving following completion of initial training is enormous and one main reason is inadequate teaching. Obviously, a good first step in choosing an instructor is to ask for recommendations from people who have already done the course. However, this is just a first step. Your friends and social media contacts are not necessarily a reliable source. There is a good chance that their own diving instructor is the only one they have ever met, so they have no point of comparison and are unable to be objective. They are also not you. Your learning preferences may be very different from theirs. Once you have some recommendations, talk to the instructors directly, either by phone or in person. Interview them. After all, although they may not realise it, they are technically applying for the job of teaching you to dive. Ask all the questions you can think of and assess the enthusiasm of their response. Do their answers reassure you or do they fill you with further doubts? Does it sound like they care? After all, if they don’t have time for you before you’ve paid for your course, then you cannot expect to receive the attention you need after they have pocketed your money! Try and get a chance to observe at first hand each instructor’s attitude to training and personal dive skills. Ask the instructors if you can attend a swimming pool session as an observer or pay to go out snorkelling on a boat trip when they are teaching or guiding. Do the instructors devote 100 percent of their attention to the divers in their charge? Do you find their personality and approach to work sympathetic? Above all, are they professional? As a non-diver, it may be difficult for you to judge whether dive instructors are being professional or not. Let me try to help. Here are some things that will strongly suggest that you are in the presence of someone who really knows what they are doing when they are teaching beginners. ● The student divers are wearing equipment and thermal protection that looks similar to the equipment that the instructor is using. ● The student divers are working in pairs when they put their equipment on and take it off. ● The instructor is letting the students work together independently, intervening only when a mistake goes uncorrected. ● The instructor is present ALL the time when the students are in or close to the water. ● The instructor works tirelessly teaching the divers their self-rescue skills, encouraging them to repeat them frequently so they remember them. ● The students look like they understand what the instructor is saying: There is genuine communication between them. ● The instructor is willing to spend extra time personally with a student who is having difficulty with something. ● Underwater, the student divers are swimming almost horizontally, rather than at an acute angle with head up and feet down. ● The divers’ hoses are secured to their BCD: they are not hanging down beneath them and dragging on the bottom of the pool or seabed. ● The students spend a large part of their time swimming or floating motionless in mid-water. They do not spend the whole session kneeling on the bottom. ● The instructor makes sure the students keep their arms tucked in front of them or by their sides when they swim. ● The instructor is positive at all times. They do not criticise; they do not blame; they do not ignore student questions; they are always ready to explain. They keep moving but do not rush. They do not waste time; they are organised and, if they are teaching more than two students at the same time, they are smart enough to have an assistant on hand to help them. This is a key factor that is often overlooked. 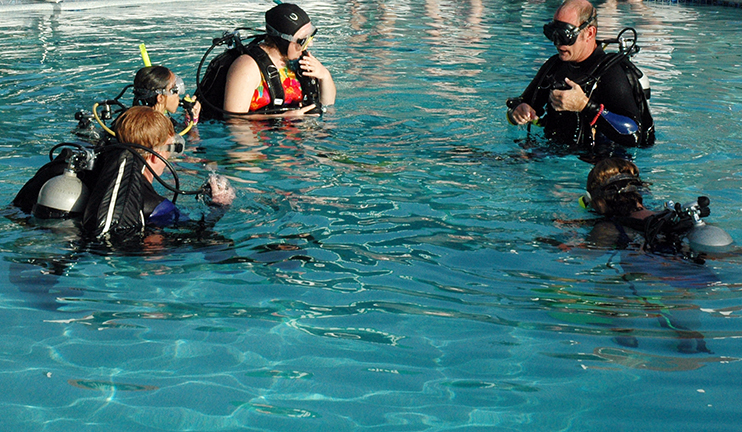 All scuba instructors can teach people to dive, but not all instructors are used to working with new divers. You should choose someone who has significant recent experience teaching people to dive from scratch. You want to learn from people who know what they are talking about, but be aware that the length of time that an instructor has been teaching may not always be a reliable indicator of quality. Someone who has been doing the same thing for a long time can become jaded and set in their ways. A newer instructor may be more enthusiastic, attentive to detail, open to new methods and ready to put in extra time. Scuba diving courses do not cost the same all over the world. To add to the confusion, you may be quoted prices that vary widely even when you ask around on the same beach or in the same town. How can you ever know if you are getting a good deal? In the world of scuba diving, rest assured that you almost always get what you pay for. So, once you have found an instructor who seems professional and caring and whom you feel is someone you could work well with, pay what they ask. If they seem to be more expensive than others you have found, this is probably because they like to teach classes with fewer students so they can offer more personal attention, are good at what they do and pay their assistants well. The fact that an instructor can charge more and still stay in business may also mean that your research has been successful and your good feelings about the instructor are well placed. If, on the other hand, your chosen instructor seems to be offering a cheaper deal than what you would expect, check how many students will be in the class and decide if you are comfortable with learning in a larger group. Ask also if learning materials, equipment, boat dives and any extra tuition necessary are included in the price. If you are learning to dive at home, a cheap price is not necessarily a sign of a poor quality course. It may simply mean that the instructor only works in diving part-time or is a dive club volunteer. If you are shopping for a dive course on holiday, never make your choice simply on the basis of price. A cheap course will always mean rushed lectures, short dive times, a tight schedule and little time for questions, individual assessment or remedial work. If the course seems cheaper than courses offered elsewhere, it is certain that the instructor will cut corners. You will not notice when this happens or know which corners have been cut. Simon Pridmore is the author of the international bestsellers, Scuba Confidential—An Insider’s Guide to Becoming a Better Diver and Scuba Professional—Insights into Sport Diver Training and Operations. He is also the co-author of Diving and Snorkeling guides to Bali and Raja Ampat and Northeast Indonesia. This article is adapted from a chapter in his new book for not-yet-divers and absolute beginners called Scuba Fundamental—Start Diving the Right Way. For more information, please visit: SimonPridmore.com.